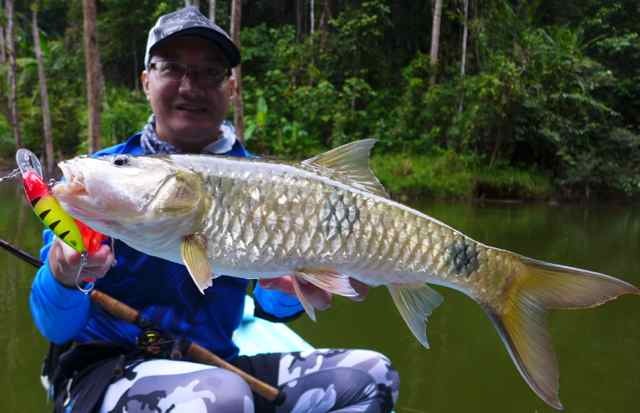 A good bend being put on Mike Kho's rod by a Murum sebarau. 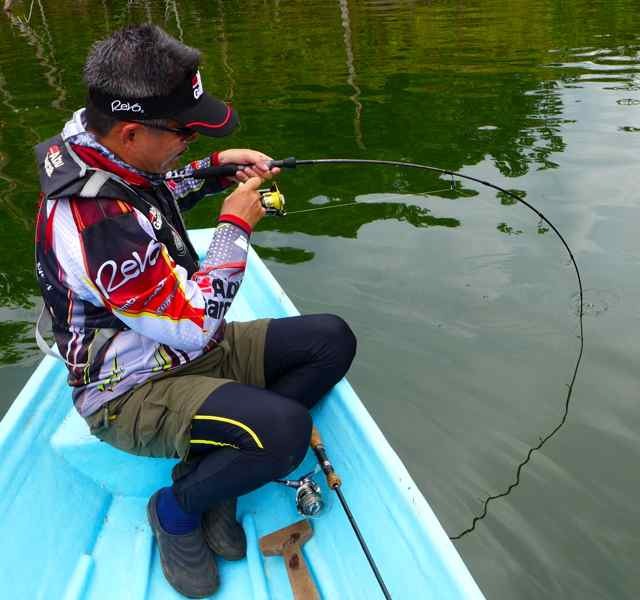 In the midwater depths I used smaller medium depth lures like the Tilsan Bass. The two-barred sebarau (Hampala bimaculata) is easily distinguished from the one-barred sebarau by the two blackish blotches. The one-barred sebarau does not have the black blotch near the wrist of the tail. In some of the deeper “lubuks” we need to use big-bibbed lures like the Sorcerer 90 +4m and Poltergeist +5m to get deep enough to the sebarau's strike zone. All of us changed our lures to single hooks. For the smaller lures like the Poltergeist 50 size I used Mustad Kaiju In-line Singles size 1 or 2. 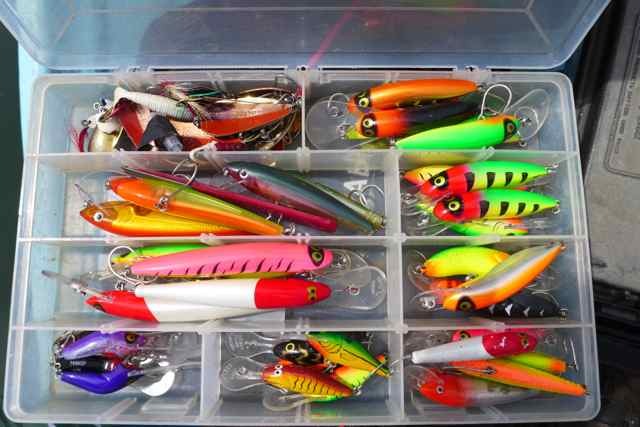 For the larger lures like the Sorcerer 90 or Poltergeist 80 I used size 2/0. Using single hooks that can take the power of the sebarau is essential. 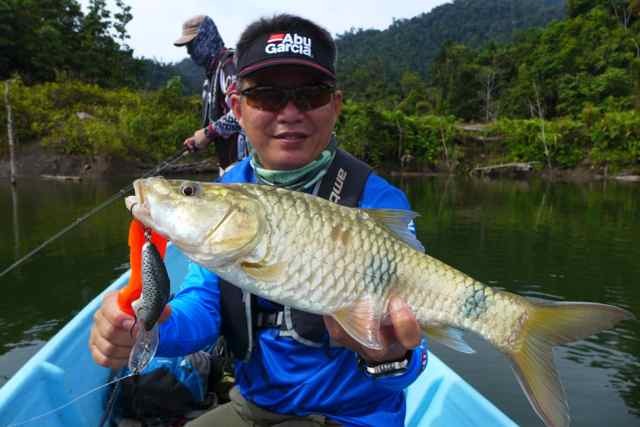 Not all single hooks for crankbaits on the market are strong enough for our sebarau fishing. 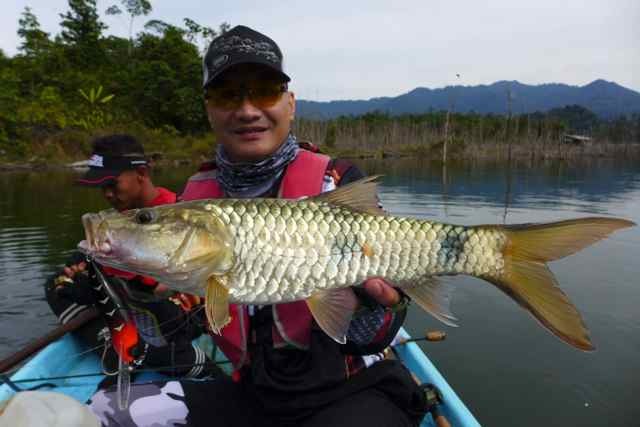 I fished in both these dams in 2016 and noticed some similarities between Murum dam Bakun dam in terms of the fishing when they were first impounded. Yet, they are different in 2016 as Bakun is several years “older”. What is noticeably similar is the catch rate of the fish. 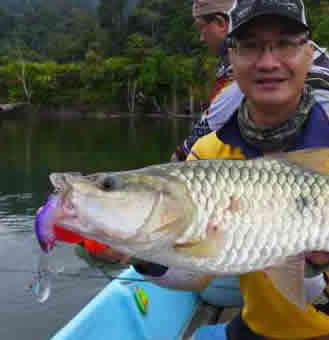 When Bakun dam was first impounded there was a fish population boom. Similarly there has been a fish population boom too in Murum dam. But the similarity ends there. 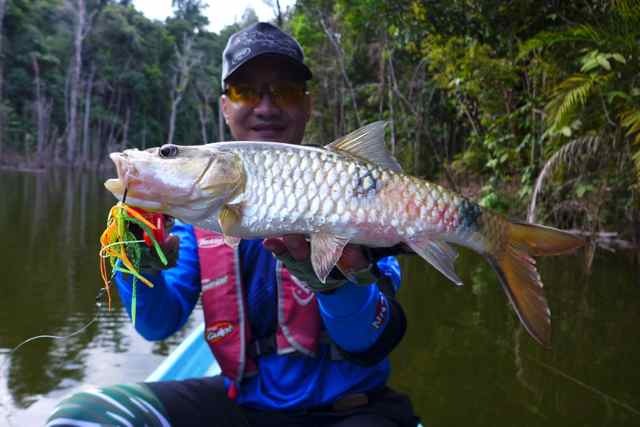 Bakun's fish population boom involved many species. We saw iceboxes upon iceboxes filled with tapah and baung averaging 5kg arriving at the jetty. There were also lots of smaller fish species like lampam and tenggalan being netted and brought to the jetty in iceboxes for sale. Murum on the other hand did not have this boom of species. There were no tapah, lampam, or tenggalan and the numbers of baung caught were considerably fewer than at Bakun in its heyday. However there are lots and lots of small tilapia hanging around the bank edges and the floating house. These came from the fish farms in the valleys that were flooded during the impoundment of the dam. 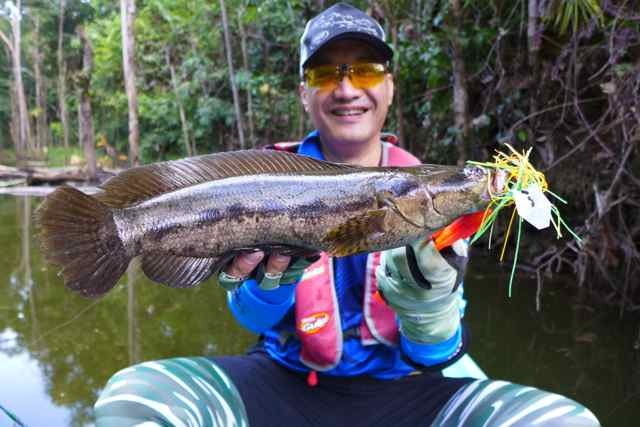 Like Bakun in the earlier days, there are a lot of sebarau, ever keen to bite at the stream and river mouths. 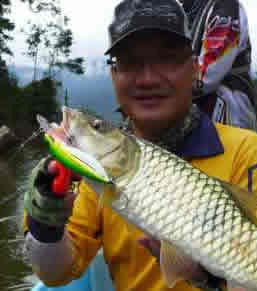 However, unlike in Bakun, those we caught in Murum dam were ALL of the two-barred sebarau (Hampala bimaculata) species. 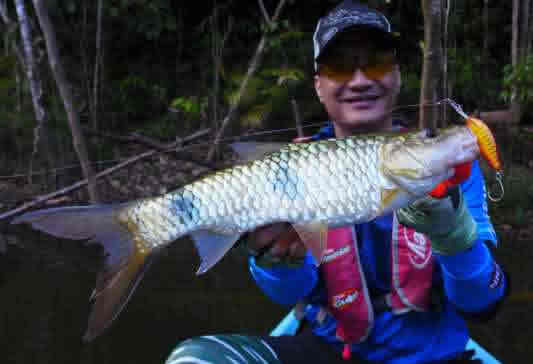 In Bakun we caught primarily the one-bar sebarau (Hampala macrolepidota). Murum is part of the same river system as Bakun dam, but it is at the upper reaches, above Bakun dam. The water elevation of Bakun dam when it is full is around 750ft (230m); whereas Murum is about a thousand feet higher. We were fishing at an elevation of over 1750ft (540m). This means the rivers from which the fish originated were up to a thousand feet higher than those in Bakun. On some occasions, bright coloured lures like the Halco Sorcerer 90 - Axel colour worked very well. On other days, dark lures like the Halco Sorcerer 90 in the Blood Nut pattern worked better. I surmise that the two-barred sebarau are the predominant or sole sebarau species at these higher elevations. Correspondingly the other fish species that were not present must also prefer lower elevations for their habitat. Before our trip when we asked for some advice we got comments like “one cast, one bite”, or when we asked what lures worked well the response was “they will bite anything”. Well our visit in November 2016 certainly was not like that. We had to work hard for the many sebarau (and odd bujuk) we caught. 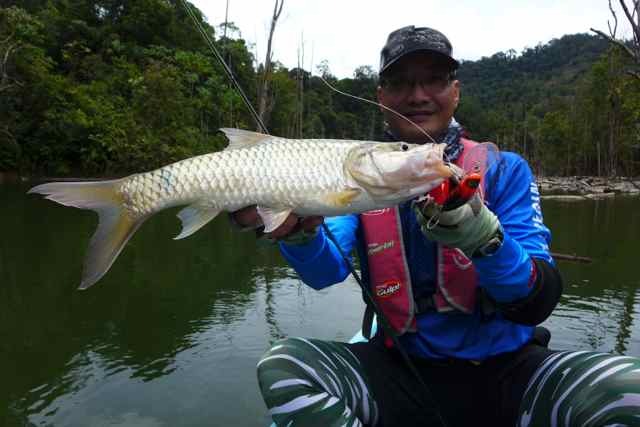 In shallower waters, this Jaw Knocker Mumbler, a skirted blade/bibbed jighead type lure attracted the interest of sebarau and bujuk. As it is retrieved it produces a thumping vibration like a crankbait that arouses the strike instincts of the fish. 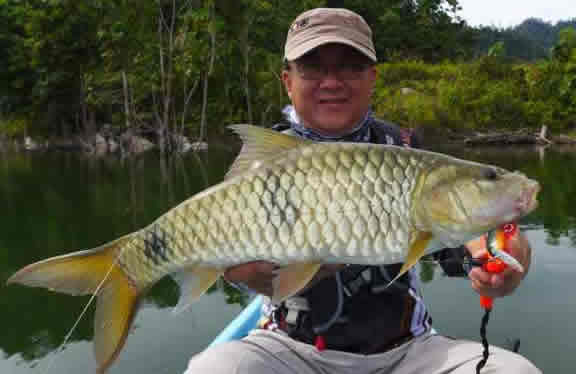 We brought a variety of lures, and only some of them were consistent in catching sebarau. 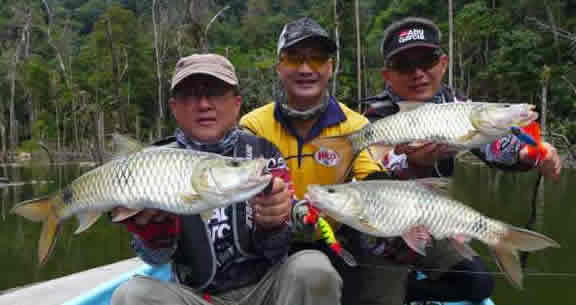 We found that the Murum sebarau were partial to the same lures that were successful for sebarau in Bakun. On one day we were getting out fished by Mike by at least 5 to 1! We used the same lures and yet he was putting us to shame. At that time he was using a spinning reel and because his gear ratio and spool size was different from ours, we could not replicate his lure retrieval speed purely by eye-balling his hand cranking speed. When we went back to the floating house for our lunch break, I got him to crank in the hot lure of the day with his rod and reel. I watched his cranking speed, then I took his tackle and matched his cranking speed to feel the vibration frequency of the lure. Then I took my own tackle, a Revo Rocket and a Revo Black 9 and used the same lure type and varied the cranking speed till I got the same frequency of vibration that Mike had been using. It turns out I was using too slow a cranking speed. My initial bites that day were on pauses and slow speeds so I had stuck to that cranking speed, whereas Mike had consistently been getting the bites on a medium-fast speed which made the lure produce a higher frequency vibration! 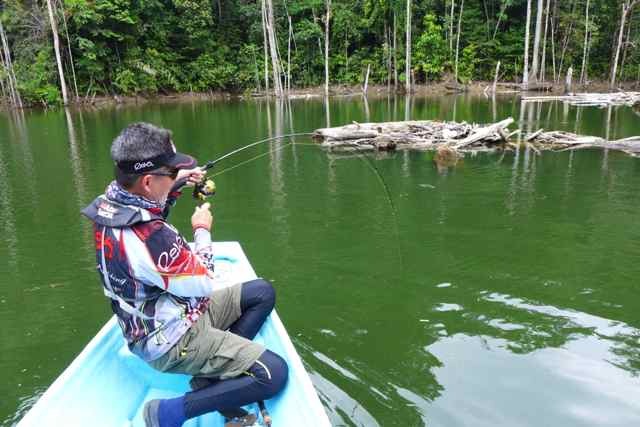 The Bassman spinnerbaits got the sebarau that were holding deep, tight against the structure or steep drop offs, by dropping into their strike-zone. The blades produced a gentle vibration during the fall. When the spinnerbaits are retrieved the vibration will increase in tempo and frequency. This is when the sebarau will hit!